Salted Chocolate Oatmeal Raisin Cookies – Hands down, my favorite homemade cookies. The are sweet, salty, chocolatey, and chewy. What else could you ask for? 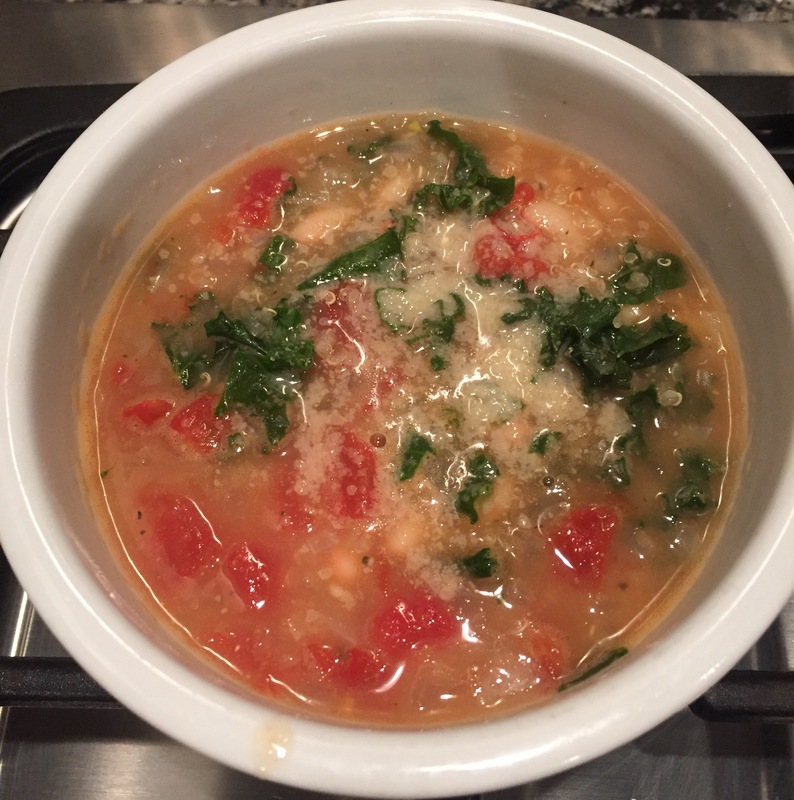 White Bean and Kale Soup – This is a slow cooker recipe turned cook top recipe. I was hungry for soup but didn’t want to wait hours for the slow cooker. 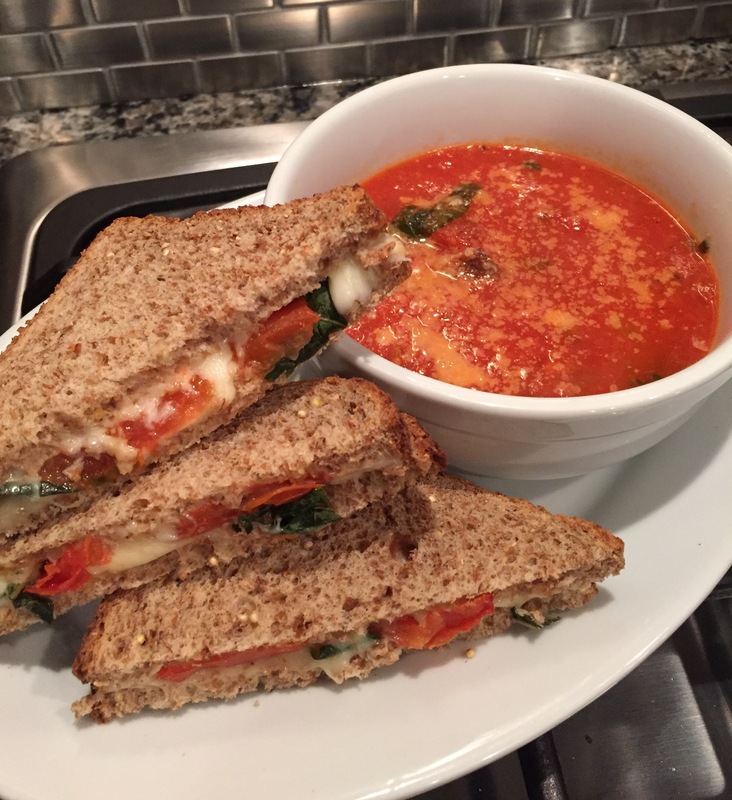 With a few adjustments, this soup was ready in 30 minutes! Truth moment: I ate three bowls in one setting! This thick and hearty soup will definitely be on repeat. 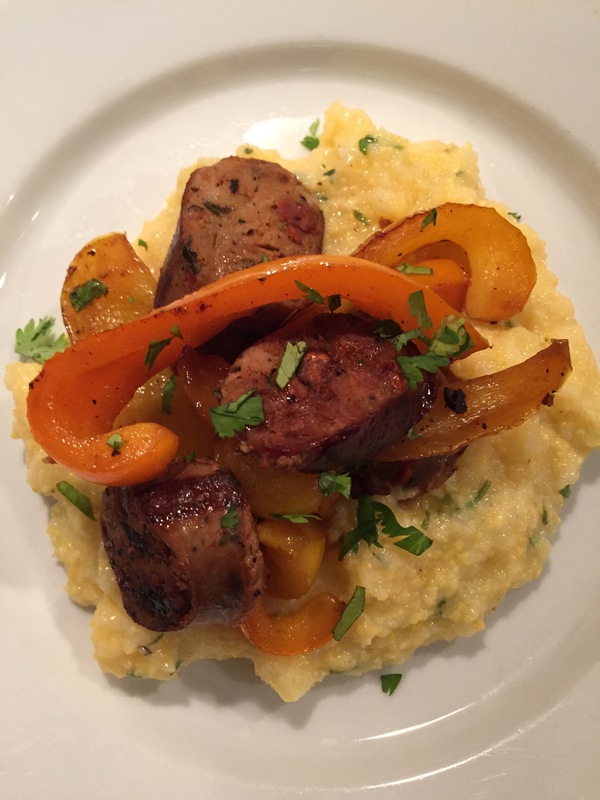 Cheesy Polenta with Bell Peppers & Chicken Sausage – A favorite entertaining recipe because it’s incredibly easy and flavorful, not to mention is visually impressive. Don’t plan on leftovers – it’s all gone every. single. time. 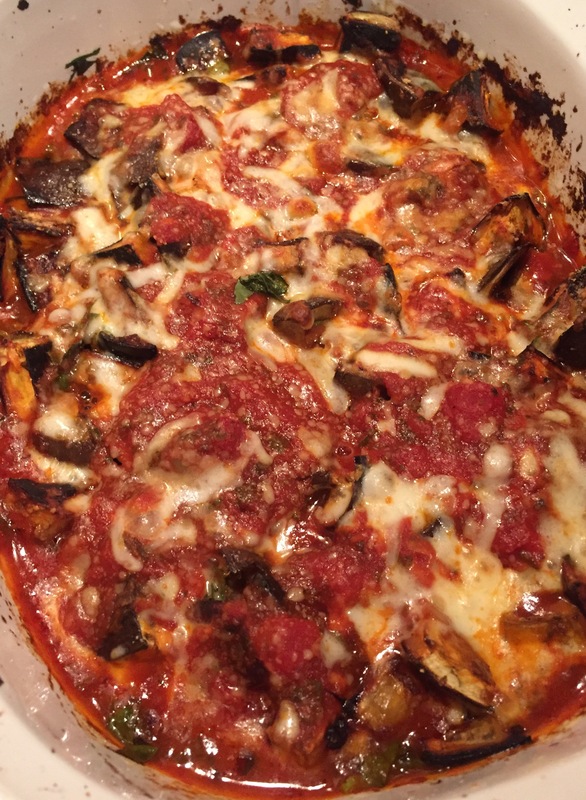 Cheesy Eggplant Casserole – This just became a new side dish I added to my repertoire. I mistakingly served it as a main course and quickly discovered that it was not enough to make a meal. Next time (in the very near future), I’ll serve this along side some pan seared chicken and a salad. Try to eat just one – dare ya! Directions: To a large stock pot, add 2 cups of stock and quinoa. Bring to a boil. Reduce to a simmer and cover. In the meantime, add 1 can of cannellini beans and the remaining vegetable stock to a blender. Process until a creamy texture is achieved. Once the quinoa is fully cooked, add the remaining can of cannellini beans, pureed beans/broth mixture, can of diced tomatoes, minced garlic, onion, dried herbs and pepper to the stock pot. Bring to a boil and immediately reduce to a simmer. Cook for 15 minutes, stirring occasionally. Add the kale and allow to simmer for 5 minutes. Top individual servings with Parmesan cheese and a drizzle of olive oil. Directions: Warm a small sauce pan to low/medium heat. Add the milk and polenta. Mash the polenta with a firm whisk or fork and then stir until creamy. Add milk by the tablespoon if it’s too thick. If it’s too watery, don’t worry. As it continues to cook, it will thicken. Reduce heat to low and stir in one-half of the cheese and one-half of the cilantro. Allow to rest on low. If your stove top burner is too hot on low and the bottom is sticking, remove it from the heat source. It can warmed easily on low before serving. While the polenta is resting, heat a large skillet to low/medium heat. Add the olive oil and then sausage. Cook 5-6 minutes or until hot and slightly browned on both sides. (If using precooked sausage, you just need to get it hot). Remove the sausage from the pan (retaining the olive oil and juices) and cover the sausage with foil to keep warm. Add ½ tablespoon of olive oil to the skillet and then the peppers. Add some freshly cracked salt/pepper. Cook peppers until softened and slightly blackened. Return the sausage to the skillet. Directions: Line a baking sheet with aluminum foil and lightly spray with olive oil. Toss cubed eggplant with 1 T. olive oil and ½ t. sea salt. Spread evenly on the baking dish along with the whole garlic cloves. Roast for 15 minutes. Halfway through roasting, flip the eggplant with a spatula half-way and remove the garlic cloves. In the meantime, lightly spray a baking dish with olive oil. Roughly chop the garlic and add it to a medium sized bowl along with the marinara, cayenne pepper, basil, and mozzarella. Once the eggplant has finished roasted roasting, remove it from the oven and reduce the oven temperature to 425 degrees. Add the eggplant to the marinara mixture and gently stir. Pour the mixture into the baking dish. Top with the remaining mozzarella and Parmesan cheese. Bake for 15 to 20 minutes or until the cheese is bubbly. Allow to cool slightly before serving. Directions: Preheat the oven to 450 degrees. Quarter the tomatoes and place on a baking sheet. Drizzle the tomatoes with 1 T. of olive oil and sprinkle with sea salt. Toss the tomatoes with your hands to evenly cover with oil and salt. Roast in the oven for approximately 15 – 20 minutes until the edges are browning slightly. In the meantime, heat a stock pot to medium heat. Add the remaining 2 T. of olive oil and fresh basil. Sauté the basil for one minute, stirring constantly. Add the canned tomatoes and water (refill the tomato can with water to get all of the tomato and their juices). With a wooden spoon, break up the tomatoes (if using canned whole tomatoes). Season with salt and pepper, to taste. Bring to a boil and then reduce to a simmer. Stir in the bread. Add the roasted tomatoes when done roasting. Scrape the baking sheet to get all of the roasted bits and remaining oil. Allow the soup to simmer for 5 to 10 minutes before serving. (I like to use a hand held immersion blender to puree the soup just a bit). Serve with a drizzle of the olive oil and a sprinkle of parmesan cheese. The original recipe calls for “day old” bread. This is not essential. You can use bread straight from the bread bag. It won’t impact the recipe in the least. Directions: Preheat the oven to 425 degrees. Assemble the sandwiches as if you were making them for the traditional skillet version. Sandwich order: bread, cheese, basil leaves, tomato slices, a bit more cheese, bread). Place buttered side down on a baking sheet. Bake for approximately 8 to 10 minutes on each side. Check on the sandwiches a few minutes early to ensure the bottoms are not getting too dark. « It’s Getting Chilly. Let’s eat Chili.